Crooked, misaligned teeth can make you feel self-conscious and have serious consequences on your oral health. Dr. Kellyn Hodges can provide traditional braces to make your smile more attractive and easier to maintain. Orthodontic braces are used in orthodontic dentistry to align and straighten crooked or crowded teeth; they are also used to correct a variety of bite problems and malocclusions, as well as improve overall dental health. Dr. Kellyn Hodges offers several orthodontic solutions at her Pennsylvania practices, but traditional braces remain one of the most popular options for Philadelphia-area patients. Traditional braces are composed of metal brackets strung with archwire, designed to slowly mold the teeth into proper alignment. Metal braces are generally the most affordable orthodontic option. Traditional metal braces are also required for patients in need of extensive orthodontic realignment. During a personal consultation with orthodontist Kellyn Hodges, our team will tailor a proper course of treatment, and determine if braces are right for you. We can also incorporate this type of orthodontics into a complete smile makeover. Patients of all ages can benefit from conventional braces. In some instances, we may even recommend early orthodontics for children. By addressing issues while your child is still in the developmental stages, we can help them avoid more complex orthodontic problems in the future. Teenaged and adult patients may also wish to consider Invisalign®, an alternative to conventional braces. This system straightens the teeth using a series of removable, clear plastic aligner trays rather than metal brackets. However, if you have severe or complex alignment problems, you may be better suited for traditional orthodontics. During a consultation at our practice, Dr. Hodges can determine which option will be most effective for you. Many individuals seek orthodontic treatment because they desire straighter teeth. While braces can certainly enhance the aesthetics of your smile, they also improve your bite and protect your overall oral health. Traditional braces are the most widely used and most economical orthodontic option. Braces use constant force and pressure to slowly move teeth into proper alignment over time. 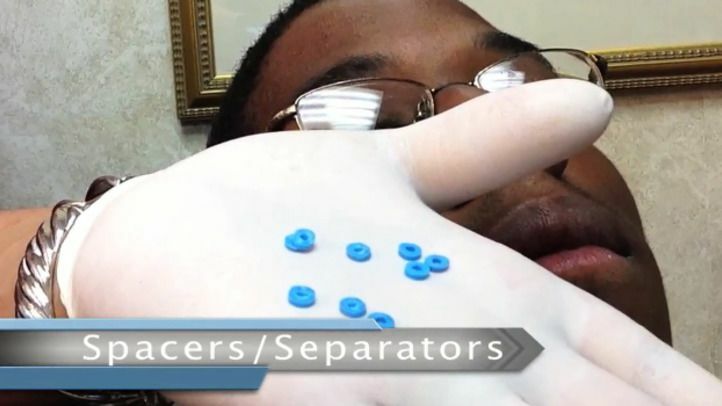 Using brackets, archwire, bonding material, and ligature elastics, commonly known as O-rings, Dr. Hodges is able to correct malocclusion and help patients improve their oral health. If you are in need of braces, please look at our various Philadelphia-area practices. After molds of the teeth have been taken and braces deemed the proper course of treatment, the procedure can begin. The braces placement procedure starts with the application of an adhesive to the teeth that are to be braced so that the bonding material is able to adhere properly. The teeth are then banded, and brackets are bonded to the individual teeth; this process usually takes just a few seconds per tooth. Spacers are sometimes used to make space for future molar banding. Once the brackets are placed, and spacers if necessary, the archwire will be threaded between the brackets and secured in place using ligature elastics. Depending on the case, there are a variety of configurations for braces to help remedy a range of orthodontic issues. The brackets, elastics, and archwires are available in a variety of colors and materials, so there are still choices, even with traditional metal braces. During follow-up orthodontic appointments the braces will be adjusted and tightened, slowly correcting the teeth by stretching the periodontal membrane. Adjustments must be made about once a month. Depending on the case, the braces treatment takes approximately two and a half years. Traditional braces are used primarily by children, but are also available for adults, though many adults opt for a more cosmetically appealing and convenient solution. Following treatment with braces, a retainer must be worn in order to avoid teeth reverting back to their original misalignment. Many of our patients choose to undergo teeth whitening to further highlight their newly straightened teeth. While not as discreet or immediate as other orthodontic options, braces are by far the most powerful and affordable. Any time the teeth are moved, some tenderness is to be expected. Patients may begin to experience slight soreness a few hours after the braces are placed. You may also notice irritation on the inside of the cheeks or sore spots on the tongue. These side effects are typical and should fade in a few days. Most patients become fully accustomed to their new braces in about one month. As your teeth begin shifting, the tension decreases. That is why periodic adjustments are necessary during treatment. Every few weeks, your doctor will monitor your progress and tighten your braces to increase the tension once more. Following these adjustments, most patients feel some soreness. Typically, the discomfort is not as pronounced as when the braces were first placed. Many individuals seek orthodontic treatment because they desire straighter teeth. While braces can certainly enhance the aesthetics of your smile, they also improve your bite and protect your overall oral health. For example, crooked, overlapped, or crowded teeth can be difficult to clean. As a result, patients with misalignment are more prone to tooth decay, gum disease, and other dental issues. Additionally, an unbalanced bite can cause the jaw joints to work overtime, leading to TMJ disorder and tooth erosion. When the teeth are in alignment, all other elements work together harmoniously for optimal oral health. Orthodontic treatment can deliver a healthier, more attractive smile, giving you the confidence to take on the world. At Dr. Kellyn Hodges' orthodontic practices, many of our patients opt for traditional braces to correct their various misalignment issues, including complex orthodontic cases. Due to their affordability and proven track record of success, traditional braces remain the most popular option for patients in the Philadelphia area. So, if you are ready to begin your braces treatment, need an evaluation, or simply have more questions about braces, Dr. Hodges can help. Please contact our Bensalem, Montgomeryville, or Bala Cynwyd orthodontics office today to schedule your personal consultation and learn more about the cost of your braces and your candidacy.